Haven't you ever thought: Are her red bottoms really Christian Louboutins? Are those Tory Burch flats real? Is that Coach purse really an authentic Coach purse? Are those UGG boots really UGGs? Is that Michael Kors wallet a knock-off? Well, U.S. Customs and Border Protection (CBP) asks the very same questions. All the big designers register their trademarks with the U.S. Patent and Trademark Office. The more sophisticated trademark owners then also record their trademarks with CBP. CBP officers protect recorded trademarks by preventing the importation of merchandise attempting to enter the United States which may be counterfeit or otherwise infringe on the trademark rights of the trademark owner. Commonly counterfeited trademark examples are UL, HP, Apple, Microsoft, Wi-Fi, SD, Bluetooth, and HDMI. 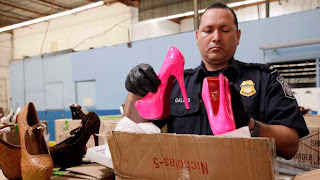 Counterfeiting is a $600 billion international business. Both trademarks and copyrights are recorded with CBP through the Intellectual Property Rights e-Recordation online system. This system allows CBP to obtain information instantly which facilitates the seizure of fake goods. Customs officers investigate imports displaying the designer's marks, and verifies if they are genuine. The cargo arrives in the United States and is detained by CBP officers. Often, the importer is asked to provide written licenses from the trademark owner authorizing the manufacture and importation of the items. Often, a sample of the detained items is shipped to the trademark owner for careful examination. Once the trademark owner confirms that the item is counterfeit, CBP seizes it. A formal letter from CBP's Fines, Penalties and Forfeitures Office is eventually sent to the importer.The importer can then file a Petition with CBP requesting the release of the items. Sometimes, the importer decides to go to Court to get its merchandise released. The trademark owner is then much more involved in the process. The commercial center is swarmed and it's difficult to recognize your business from your rivals. Trademarks are an effective ad specialized apparatus to catch client consideration and make your business, items and services emerge. trade mark register.